I’ve spent the last few days writing a tutorial on how to build your own video site, and ended up with what I’ve jokingly been calling MyTube. Like YouTube, it’s full of short videos of cats, however unlike YouTube, you can take my code and stick it anywhere you like (In the upcoming magazine article I even show you how to build your own custom player with just 5 lines of code and a free web development tool). Do you think I can sell it to Google for a couple of billion dollars? I took advantage of John Lewis’ technology clearance shelves in their Peter Jones store yesterday, and spent £25 on a new DSL router for the house network. While switch to DSL Max a while back had sped up our network connection a fair bit, I wasn’t entirely sure that we were getting the best out of the available connection. To be honest, the fact that Linksys hadn’t fixed the VPN bug in there firmware which meant that a PPTP connection wouldn’t traverse the NAT mappings was also a problem. So when I saw a D-Link DSL-G624T for not very much at all, I decided it was worth trying a swap out. After all, this was a router that was designed for ADSL 2+ connections, instead of my old ADSL 2 hardware. Setting up the new router wasn’t quite as easy as my previous Zyxel and Linksys devices, but once I’d understood how it mapped NAT connections for my servers, I was able to get it up and running in fairly short order. While web pages seemed a little snappier, it wasn’t until I decided to download a DVD image from the US that I saw things had really improved – I was getting sustained download speeds of over 750KB/s, rather than the (still respectable) 400-500KB/s I’d been getting before. It’s hard enough trying to run one development project, let alone several. Managing a whole portfolio of projects across a business can easily be compared to juggling Fabergé eggs in a tornado, with only one arm. Projects need to be delivered on time, to the original requirements. Resources need to be deployed appropriately – whether they’re staff or infrastructure. Then there’s the really tricky bit, making sure that all the projects are aligned with the business aims. Today’s flexible businesses need IT departments that can respond to changing needs – adapting project plans quickly. It’s no wonder that a new generation of project management tools has arrived, tools that are able to bring information in from multiple sources to help control the myriad IT projects that cover white boards and fill spreadsheets. Read on and become enlightened. It’s a wonderful whole new world of project governance – with tools to make it easier. No more, no less. Today (as I’ve said elsewhere) is the 15th birthday of SMS. It’s surprising what you can say in a message: it could be a throw away comment or something important. But it’s said. One bad pun and a dose of Jennifer Crusie (fan club motto: “Got Snark”) led to this icon I made for over the weekend. Strikes me as a good thing – the Moomins and fun genre fiction, along with a chance to hone my photoshoppery. For those interested, the book in the Snorkmaiden’s hand is What The Lady Wants, which mixes noir and romance in the manner that Cruisie later explored again in Fast Women. What if Socrates had used Facebook? After all, he was a great one for sitting around and talking about himself. And isn’t that what Facebook is for? Extract from Plato’s The Banana Republic.Socrates and Glaucon are discovered in the Facebook group called’Philosophy is the new iPod’. Socrates has created a new thread. SOCRATES has 6 friends in the network Philosophers. SOCRATES:I thought I would kick off a new one on the nature of human companionship. ‘Be slow to fall into friendship; but when you are in,continue firm and constant’ as a great man once said. Oh yes, I did. GLAUCON: Nice one, Socco. Talking of friendship, I hear that Catherine Tate is all set to return to the Tardis to reprise the role of Donna. My heart is sore. SOCRATES: And how does this bear on the nature of friendship? GLAUCON: My reasoning is thus. In the first place, Donna’s grating voice and her sarf London accent– apparently a prerequisite to getting hold of a Tardis key these days,by the way, no matter how many hearts you possess – offends my ear,even so that my enjoyment of The Mill’s special effects is disturbed. In the second place, this seems to be a continuation of Russell T Davies celebrity obsession, which is running wildly out of hand. Tate, Kylie, that actor off of ‘Life on Mars’. What will he do next?Reintroduce Bonnie Langford? And in the third place, why couldn’t we have that posh blonde out of the scary statues episode? That would make more sense in terms of continuity. 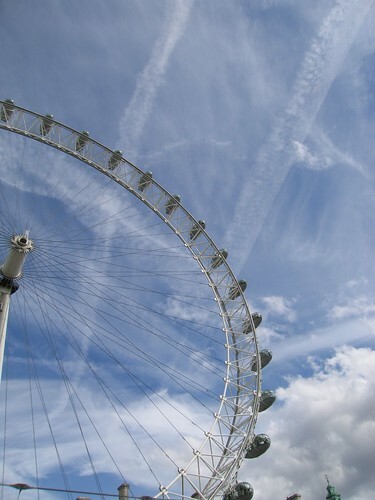 The London Eye against a changeable sky, photographed from a boat on the Thames. 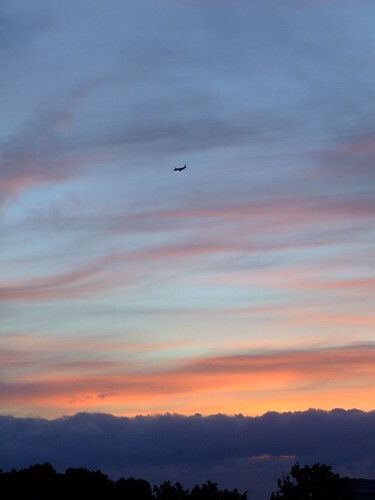 Airliner on its final approach to Heathrow, flying through the sunset clouds over southwest London. 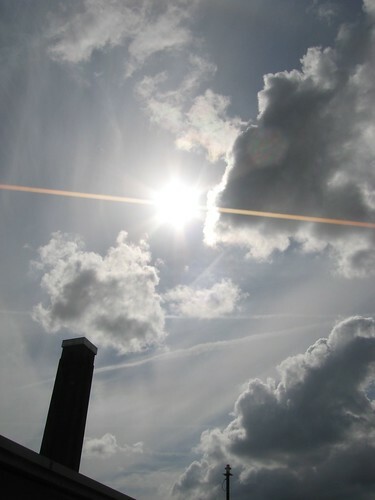 Bright sun over the distinctive shape of the old Bankside power station in central London.